You’re up against the best of the best in wastewater operations. The watching crowds are enthusiastic, engaged, and LOUD. The timer is ticking, your heart is pounding, and you and your team members need to be in the flow with each other like you’re one mind. It’s what you’ve been training hours for. You got this. The water and the tools are flying! 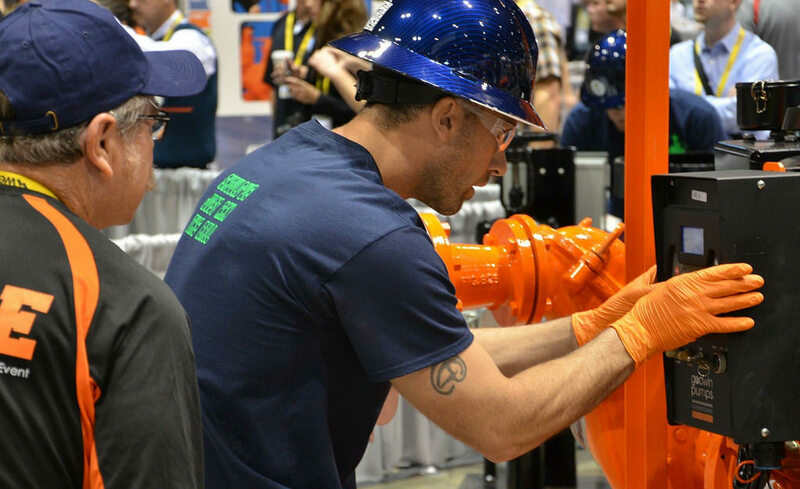 WTD Operators Dustin Harris and Chad Vertz repair a pipe at hyper-speed as part of the WEFTEC Collections event. The teams replace a piece of pipe as fast as they can – drilling and cutting at speeds you might not believe. The Poofighters are the King County Wastewater Treatment Division’s team at the international Operations Challenge at the Water Environment Federation (WEF)’s WEFTEC conference – a “wastewater Olympics” where they compete to test skills required to maintain and operate a treatment system. The teams that compete show what it takes to run a major, industrial facility, including mental and physical challenges. 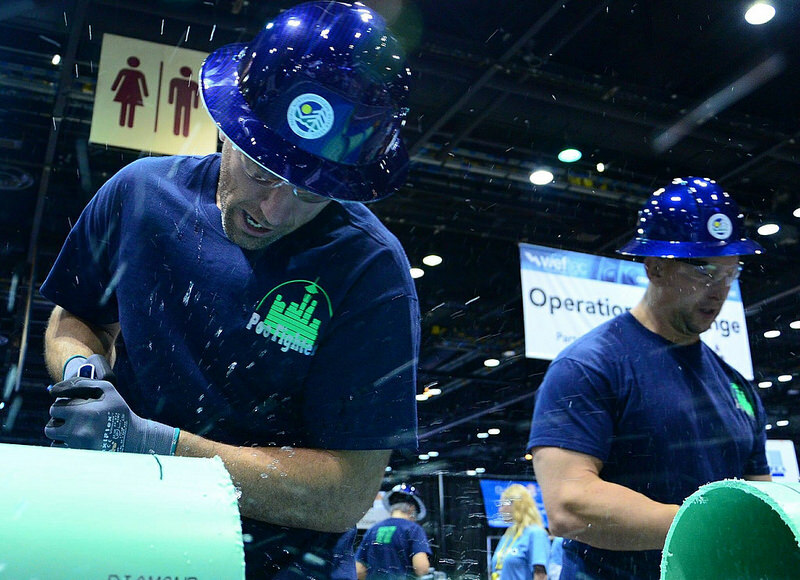 This year’s event in Chicago, Ill., was the largest event in the history of WEFTEC with 44 teams from across the world participating. Teams prove their skills in five different, timed events where judges scrutinize their every move. The first event is a written test, and all of the other events involve physical, real-life-simulated scenarios – including rescuing a coworker (really a safety dummy) from a manhole. The clock is running, but you’ve got to be accurate! Wastewater treatment plants use biological processes to clean water, just like nature does. Lab technicians help monitor the processes at a plant, and ensure that the water meets regulatory standards. 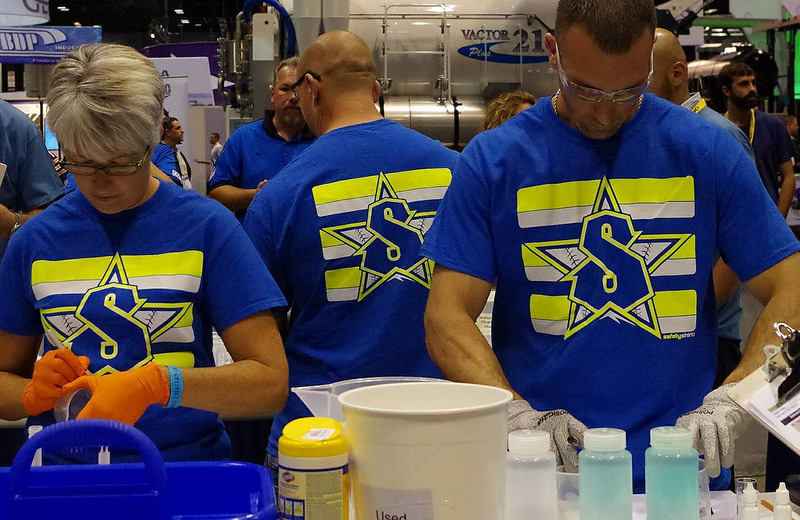 In the WEFTEC Lab event, Poofighters Suzanne Potts, Chad Vertz (background) and Dustin Harris use lab equipment to test alkalinity. The Poofighters team – Process Analyst Suzanne Potts, Operators Darek Kenaston, Dustin Harris, and Chad Vertz, and Team Captain Chad Clay, were enjoying the comradery among themselves and the competitive but friendly environment. “Did we have fun? Yes! But we’re not putting that part in the story,” laughs Clay. The Poofighters’ teamwork shows that working in wastewater can be dynamic and fun. Poofighter Dustin Harris works quickly in the WEFTEC Maintenance event. The scenario in this event mimics the failure of an important pump during stormy weather conditions, testing the teams abilities to respond in an emergency. They need to get back-up equipment up and running using proper safety and tools. As employees with rich, technical know-how head towards retirement, many utilities are finding it difficult to recruit and train new, skilled people to take their place. WTD is competing with other agencies for quality job seekers – and replacing people is not the same as replacing experience. The Poofighters team helps recruiting efforts by “showing people what we do and what we’re like to work with,” explains Clay. “It also gives our current employees opportunities to cross-train and develop their workmanship. Plus, it helps us build relationships with other operators in our business”. For videos of the team, or to learn more about events where you can meet them and maybe try your own hand at one of their demonstrations, visit www.kingcounty.gov/Poofighters. To learn more about careers at WTD, visit www.kingcounty.gov/wtd-jobs.